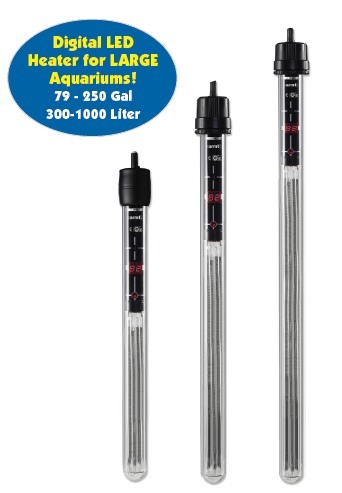 Ebo-Jager is known for quality Aquarium Heaters for over 20 years. NEW Jager German made models now manufactured in Germany by EHEIM , continues the tradition of a quality submersible thick shatterproof glass heater with Eheim’s reputation for quality control and manufacturing expertise. Experienced fish breeders will not risk their livestock with anything else. Easy to adjust dial with temperature graduations and unique feature that allows user re-calibration. UL listed models required in many commercial applications. In larger tanks or Central Filter Sumps, combine these heaters with our Temperature Controller for unparalleled temperature control. Multiple heaters work best when controlled by one Temperature Sensor as opposed to individual heater thermostats. General rule of thumb for sizing is 3 - 5 watts per gallon of water. Stay on the higher side of range if your room’s ambient temperature is lower than normal (as in basements) or if you are keeping very warm water fish such as Discus. We discount in quantity and combinations of any size can be made for quantity price break levels. A new option for large aquariums. The safety of a glass heater with its own integrated thermostat. Can also be operated with controller and have redundancy of second integrated thermostat on heater (set 4-5 deg higher than controller). Also good for Acrylic / plastic sumps. PURPLE = Sensor shows heater out of water and thermal protection disables heater permanently. ALL MODELS UL LISTED FOR SAFETY & RELIABILITY. Note: Most heaters can be damaged from running non-submersed which can cause degradation of sealing compound by allowing moisture to enter heater. This can cause corrosion or worse, a short circuit. Always disconnect heater and allow to cool before exposing heater to air. PRO-HEAT Economy Submersible Glass Heater: A decent quality very economically priced glass heater with thick glass tube. 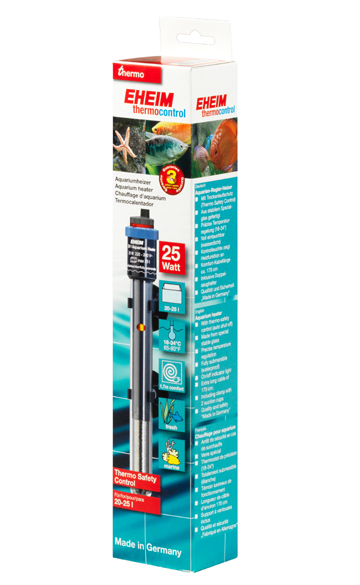 Check setting with known good thermometer for temperature accuracy, as we recommend with any aquarium heater. Accurate calibration on the majority of Aquarium heaters is not a given. For large aqauriums and Central Systems use these new Titanium heaters for best performance and reliability. These heaters do not come with thermostats and must be wired to our Controller. Larger more expensive heaters such as these are best made without integrated thermostats since failure of the integrated thermostats will cause the entire heater to be discarded. A high quality industrial controller such as our ETC or D1500 will ensure fail safe operation for many years. When the value of your livestock is high, as in coveted breeding stock or fish in larger display tanks, it does not make much sense to entrust their well being to inexpensive production made Aquarium type heaters. Note that all large wattage heaters must be handled with appropriate precautions to avoid overheating. Heater must be fully immersed at all times and even after power is disconnected for a period until tube has cooled to avoid excessive temperature rise of the heating tube while exposed to air. An alternative for larger tanks is to use lower wattage aquarium heaters all connected to a single quality controller to achieve the same wattage required. 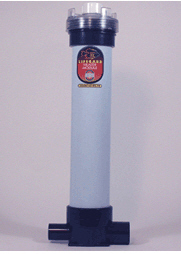 Heater Adapter for Sumps: Use on Wet-Dry sumps, Central System Sumps, or large holding tanks. Installs through wall of sump as a bulkhead fitting does. Keeps electrical cords out of water to prevent stray voltages or cord damage. Only heating tube protrudes into sump. It is necessary to install adapter in sump below intake level of water pump to avoid exposing heater and adapter to air. Note: If heater and adapter operate without being fully submersed heater and/or adapter will overheat and cause leaks or cause damage to heater. Pump location or intake should be be designed to suction above heater adapter or a properly sized hole can be drilled in pump intake pipe above heater adapter to break suction in case water level drops in sump. A fail-safe float switch can also be installed to prevent this occurence. When heaters are installed inline from pump output. Not recommended for use with high wattage Titanium heaters. Custom fitted with standard for Ebo-Jager glass heaters. Hydronic Heating Coil for Sumps: By far the most efficient way to heat larger bodies of water as required by Central Systems or very large Aquariums. 1/2” OD thin wall coiled tubing. Tubing can be bent to fit within your sump’s dimensions. Connect to an existing hydronic heating system or install dedicated hot water heater or boiler for fish room/hatchery application. Excellent heat transfer by having tubing directly immersed in a flow through sump. Exceptional durability of Stainless Steel coil to avoid contamination of fish system or hydronic/water heater system. Control as a zone by using our ETCI controller. Connect to hydronic system copper piping above sump by flare or compression fittings. Can also be connected to PEX type tubing for easier system installation. However hydronic water system must be designed for the lower temperatures of PEX plastic tubing. Call for details. Corrosion resistant series Stainless Steel tubing, coiled.